One of the handy new features introduced with Synology’s DSM 5.1 release was an ESXi plugin for VAAI NAS. 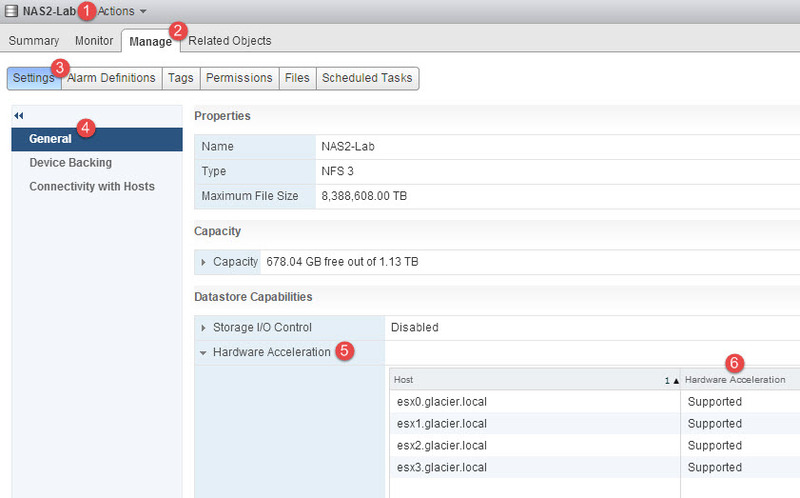 This lets you take advantage of Full File Clone and Reserve Space (thick provisioning) for NFS datastores mounted to vSphere. I’ve had a few questions come in around this feature and how to validate that it’s working properly. For all of my fellow NFS geeks out there, this one’s for you. Note: For all of the VAAI NAS primitives, refer to page 5 of this VAAI white paper. VAAI NAS requires the use of a plugin regardless of the vendor. You can snag the one from Synology here. From there, either push the offline bundle to your hosts with VUM or use whatever other method makes sense for you (esxcli, Image Builder, etc.). There’s several methods to validate that VAAI NAS is active. Look to see if Hardware Acceleration is Supported on your NFS devices via esxcli. Arrr, here be the booty! The Hardware Acceleration should say Supported on all hosts. Otherwise, expand it to see which hosts do and do not have support. View the list of hosts. If only some hosts show Not Supported, check to make sure they have the VAAI NAS plugin installed. If all of the hosts show Not Supported, verify that your NAS is running DSM 5.1 and is able to provide VAAI NAS primitives. Is VAAI NAS Really Working? Good question. The most obvious way to tell is to try cloning a VM within the same NAS, which should trigger the Full File Clone primitive. This is similar to XCOPY for block storage, which I discuss in this block VAAI primitives post. You’re essentially telling the NAS to make a file copy on your host’s behalf, resulting in a very small trickle of network traffic for control activities and operational status messages. The tail command is handy for looking at the last part of a file. The -f argument specifies that I want to actively watch for new changes. Piping it into grep gives me a way to filter out anything that doesn’t contain the string SynologyNasPlugin. The -i part ignores string case (i.e. case insensitive matches). Additionally, there’s almost zero NFS traffic traversing the wire during the clone job. I’ve highlighted my storage-facing NICs in yellow while the clone was about 50% completed. There’s under 1 Mbps of data traffic on vmk4. Keep in mind this host is also running 6 other VMs. And here is what the Synology reports for that time period. 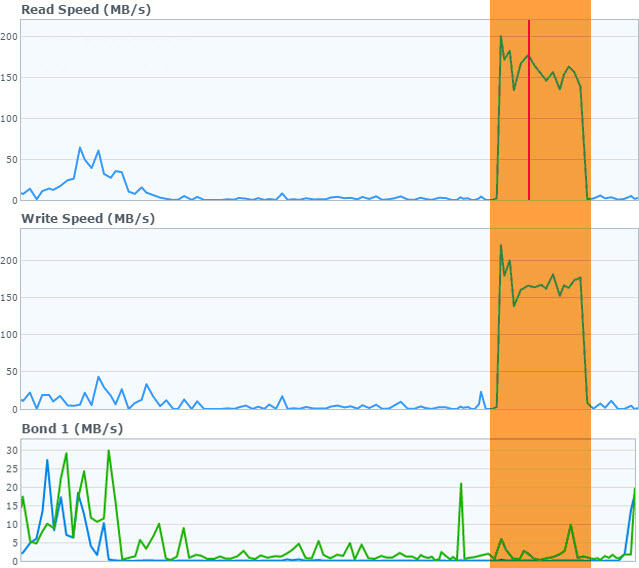 The first two charts show disk reads and writes, while the third chart shows network traffic. I’ve highlighted the full file clone in orange. The other new option is the Reserve Space primitive, which lets you thick provision your disks on NFS. This one is pretty easy to spot – when you attempt to clone or build a new VM on the NFS datastore, the options for eager and lazy thick will now be available. Pretty simple, right? I am finding that my clone operations on the DS2411+ went from 10-15 minutes without the plugin to under 2 minutes with the plugin. I haven’t tested it out much on my DS414slim yet, since that really just runs my management VMs. I would assume the results would be similar. Once again, an excellent and very well explained article! 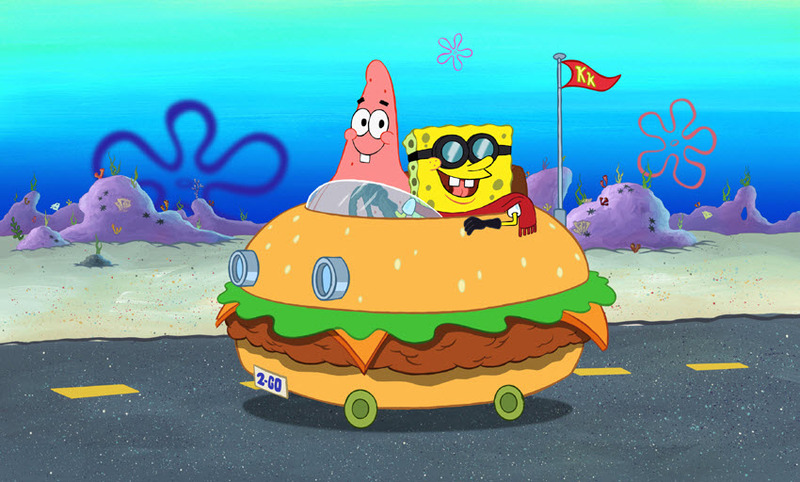 @Patrick – Indeed it does. That’s pretty cool. Synology was definitely a good choice. Synology has come a long way! Its become one of the more featured cheap Soho NAS units! Great write up! Hey Chris, thanks for the headsup about the plugin. Should check my Syno too and play a bit. Regarding “monitoring if VAAI actually gets used” – I don’t have a host handy atm to check, but couldn’t this also be monitored via esxtops device statistics? I know I know “device”, but… esxtop can do so with block storage, so it *should* also easily be able to do the same with file storage now. At least IMHO, but I can’t check for it atm. @Steffen – Unfortunately, the esxtop device statistics only shows VAAI data for block devices. The primitives for VAAI NAS are not available as options. I’ve confirmed this is still true with ESXi 5.5u2 in the lab. Thanks for confirming that, Chris! Guess it´s only a matter of time or an update then to introduce that capability into esxtop. I’m finding that only one ESXi host can connect to the NFS share… and that after a reboot the hardware acceleration is “Unknown”. Any chance you’ve compared NFS versus iSCSi (block level) for read/write speeds? Not easily done on a whim, given reformat required, just wondering. Can you still use this same version of the VAAI plugin for vSphere 6? I’m just curious because Synology still has the older plugin version for 5.5 published and I can’t seem to find a newer version.